Paseo del Mar, 2, 07181 Palmanova, Spanje. The Apartments Roc Portonova, in Mallorca, are situated just across from the yacht club in the quietest area of Palmanova with lovely views over the bay and not far from the main shopping centres, bars and restaurants. 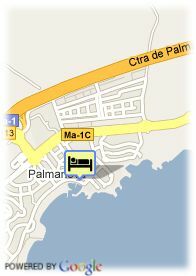 The distance to the Palma airport Son San Juan is about 30 Km and to Palma capital 15 km. The beach Son Matías is at only 100 m, therefore the most of the apartments have a fantastic view over the sea. Betalende overdekte parking aan het hotel, Reservatie verplicht.